The Centers for Medicare & Medicaid Services (CMS) currently recognizes certain credentialed professionals as nonphysician practitioners (NPPs), including physician assistants and nurse practitioners. NPPs are eligible to receive provider numbers from the CMS, and an NPP can be listed as the performing provider in Block 24J of the Medicare 1500 form. Radiologist extender is a general term for a professional who has been trained to perform services that are above and beyond the typical scope of practice for a radiologic technologist. Radiologist assistants (RAs) and radiology practitioner assistants (RPAs) both fall into this category. Over the past several years, radiology billing and compliance professionals have struggled to define appropriate ways to utilize and bill for radiologist extenders. While RAs and RPAs are highly trained individuals, their qualifications do not fit neatly into the existing Medicare framework. Practices and facilities that already have an extender on staff or are considering hiring an extender should make certain that they are able to use the extender’s services effectively and compliantly. The CMS does not define RAs or RPAs as NPPs. As such, these professionals are currently ineligible for Medicare provider numbers. Based on the current political environment, this is not likely to change in the near future. Since these extenders cannot have their own provider numbers, many practices want to bill services under the supervising radiologist’s provider number. This practice is potentially dangerous and may subject an organization to fines and penalties if audited by governmental and nongovernmental payers. Whether you currently utilize extenders or are considering adding them to your practice, consulting more detailed resources on proper billing can help clear up confusion on the topic. 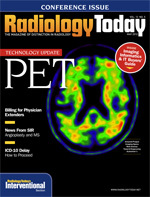 One article that may be of use is “Medicare Payment Is Contingent on Appropriate Supervision of Diagnostic Tests and Proper Use of Radiologist Assistants: Is Your Practice Meeting the Current Requirements?” by attorneys Tom Greeson and Paul Pitts of Reed Smith LLP, which appeared in the March 2011 issue of the Journal of the American College of Radiology. A question and answer article in the May/June 2010 issue of the ACR’s Radiology Coding Source, “Registered Radiologist Assistant/Radiologist Practitioner Assistant,” may also be of assistance. Many of the challenges associated with correctly billing for physician extenders are related to physician supervision, as the CMS requires physician supervision of diagnostic imaging exams and other diagnostic tests. This required supervision can be provided only by a physician, not by an NPP. There are different levels of supervision, and the particular level required for a specific exam can be determined by looking up the procedure code on the CMS website using the Physician Fee Schedule (PFS) Search feature. Supervision levels are 1 for general supervision, 2 for direct supervision, and 3 for personal supervision. While many other status codes exist, these are the most relevant for radiology. Status 09 indicates that supervision requirements do not pertain to this code. This does not mean that any procedure with a status 09 can be performed by any type of provider; rather it means that the concept does not apply because it is a physician service. Remember that the supervision indicator is attached to the technical component, so you will not see the supervision level unless you asked for the technical component modifier. For example, if selecting 74246 (upper gastrointestinal [GI] series) on PFS Search, a supervision level of 3 (personal) is noted. If 72160 (CT thorax with contrast) is selected, level 2 (direct supervision) is required. When an exam requires general supervision, the supervising physician is not required to be present. Direct supervision, on the other hand, requires a physician to be present in the office suite or imaging center during the exam. For direct supervision of hospital exams, the physician is not required to be in the department during the exam but must be immediately available to render assistance if needed. For example, a physician cannot provide direct supervision of an exam in the hospital radiology department if he is performing a procedure on another patient that cannot be interrupted or if he is so far away that he could not respond promptly. Finally, personal supervision means that the physician must be in the room with the patient, regardless of whether the exam is performed in an office or a hospital. When a radiologist extender performs an exam that requires personal physician supervision, the radiologist must be present in the room throughout the procedure, even if the extender has been trained to perform the procedure and it is within his or her state scope of practice. It is important to remember that neither the facility nor the radiologist may bill for this service if the supervision criteria is not met. For example, a radiologist extender cannot perform and bill for an upper GI series or barium enema without the radiologist being present in the room because the codes for these procedures are designated as requiring personal supervision. This requirement means that the radiologist cannot enhance his revenue by delegating these exams to the extender. On the other hand, if the exam requires only general or direct supervision, the supervising radiologist does not have to be in the room with the patient. In addition to interpreting diagnostic exams, radiologist extenders frequently perform other services, such as drainage procedures, biopsies, arthrograms, myelograms, and line insertions. Medicare’s payment to the hospital includes payment for all services provided by auxiliary personnel (ie, personnel who are not physicians or NPPs). It does not matter whether an auxiliary professional is employed by the hospital or the physician. These rules change for office or freestanding imaging centers considering the “incident to” concept. A service that meets all the incident to requirements can be billed under the physician’s provider number and will be paid as a physician service. While the concept of incident to exists in the nonhospital setting, it is important to remember that this policy does not apply in hospital settings. Also, it does not apply to diagnostic tests, which have their own supervision requirements. To meet the Medicare incident to requirements, a service must be performed as part of a plan of care that was established by the physician during a previous face-to-face encounter with the patient. Additionally, the physician must be present in the office suite or imaging center during the service to provide direct supervision. One example of an incident to service is a patient who is seen by a radiologist extender in the office setting for follow-up after an interventional procedure. The extender could potentially evaluate a patient who is recovering from uterine fibroid embolization, assuming that the radiologist saw the patient previously, established a plan of care that requires the follow-up visit, and is present in the office suite during the visit (assuming the radiologist extender must be acting within his or her state scope of practice and within the restrictions of the radiologist’s liability insurance). The Medicare incident to policy does not allow radiologist extenders or other auxiliary personnel to provide services to new patients or to established patients with new problems. There must have been a prior encounter for the same condition or problem that included face-to-face contact between the radiologist and the patient. *Please note that a person’s clinical ability to perform a service does not automatically make for a billable service. This article is not intended to comment or pass judgment on the skills, qualifications, or value of radiologist extenders but rather to address current coding and billing concerns. — Melody W. Mulaik, MSHS, RCC, CPC, CPC-H, PCS, is president and cofounder of Coding Strategies Inc, which provides specialty-specific auditing and educational services for physicians, hospitals, and billing companies nationwide.